In today’s corporate environment, money speaks much louder than words. If organizations are not willing to pay well, then employees will not be happy and content. Different companies and organizations opt to pay their workers or employees in various ways based on the system which they think, will be most suitable and advantageous for their purpose. Each company will adopt a paying system which they know is bound to keep the various employees on their toes, so as to yield maximum results and take the company to the next level. 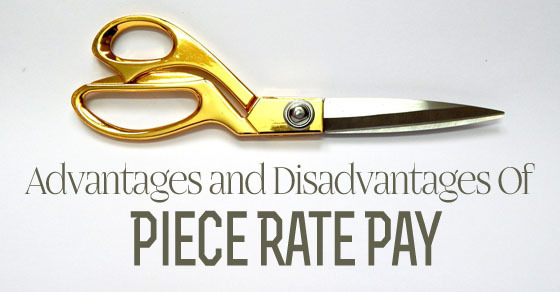 Given here are the chief advantages and disadvantages of piece-rate pay. What is Piece Rate System of Pay? The chief wage systems include that system which is based on time and the other which is based on the result which is produced. As per the first Time Rate System, the worker is paid strictly on the time like paid by the hour, which he takes irrespective of the output. He is paid either on a monthly, weekly or an hourly basis. In the second piece rate pay, it is independent of the bounds of time and is completely based on the result produced. What is a Piece Rate Method or System of Wage Payment? As per the time rate system, the amount of time taken by the worker is of paramount importance in deciding how much he is going to be paid, yet this system is independent of such constraints and time is not a factor at all. The worker is free to take as much of time as he thinks he needs in order to complete the task so as to do it to the best of his ability and produce the best results. With such system workers never procrastinate, they simply work hard and try to earn as much money as they can for their products. In the time rate system, the employees are not paid per unit whereas in this system the employees are paid per unit of work which they do. They cannot expect to be paid any time prior to showing the finished and submitting the finished product, so whether they want to take a week or a month it is up to them. Very often the workers try and finish up the job as fast as possible, this is so that they can get the money and that they can use it to help pay their domestic bills. This payment system is not necessarily based on the unit of work which is complete or product wise, it can also be in terms of when a job is completed entirely. If the workers fail to complete the task or give up midway then they will not receive any payment amount at all. This kind of payment is especially used when big events are being organized or when a big job is being carried out. For example, most workmen are paid only when the task is completed. This task could be a painting or repair contract. Chances are if they are paid in advance or as per hours worked then they will simply procrastinate and cheat the persons who have hired them. The piece rate system is set in order to award your employees with a payment based on the number of finished pieces. The whole process is done by making use of Piece Rate Calculations. Here are a few cases where the piece rate system methods can be successfully applied. Workers are paid reasonable rates. The relationship between the reward to be paid and the work that an employee performs should be very clear as per piece rate system. Piece rate system is very flexible, simple to operate and easily understandable. This is the type of wage system where the wages er paid to the workers based on the output or result of work done. This is a type of wage system where the wages are paid to the workers after the completion of work. High piece rate is offered to workers who completed the work within the given time and low piece rate for those who exceeded the given time for the task. This kind of payment is made in terms of a formula, which helps make things a lot easier so that the employees and workers can tell exactly how much money has to be paid to them. The total wages which are earned are calculated simply by finding the product of the total number of outputs with the pay rate which has been decided upon per unit produced. This is just simple calculations which can be easily done with the help of a calculator. The employees can keep a tab for himself and the employer can do the same and finally, they can compare and see if their individual calculations tally. One of the biggest and major advantages of this piece rate pay system is that it helps to increase the efficiency of the employees keeping them busy all the time. They are well aware of the fact that them getting paid or not is dependent on their own work output. If they fail to work efficiently and quickly then that is going to bring about their own downfall. Having such efficient workers in the company not only ensures that the work is done quickly but it also ensures that the company rises from strength to strength slowly making its way to the top. In the time rate system, the workers need to have a constant supervision, because if not then they will try to drag out the task for as long as possible so that they can get as much money as possible. Why would they try to finish the task off faster when they can get more money for doing nothing at all? Tactics like this are often employed by the workers, where they take the employers for a ride. In this piece rate plan system, very often the workers take it upon themselves to do the task as fast as they can and they have their own sense of responsibility. As mentioned above, the simple formula which is applied to calculate the earnings of the workers makes things rather simple for everyone concerned. In the time rate system, keeping a track for the number of hours of work done by each employee becomes a very difficult task indeed and most often there is no proof or accountability. In this system, everything is very clear and transparent, since if the task is done, then the finished product will serve as the proof. The few calculations involved means that there is less scope for error as well as mistakes. In this day and age, time is of the essence and time means money. If the workers take their own sweet time completing the task at hand then the only one who is going to suffer is the company. The company will suffer on two fronts, firstly they will have to keep paying the employees more and more money because they are taking so much time with the work and secondly, because they will not have any products to sell since the employees are working so slow. A major advantage of a system like this is that the employees are seldom idle and they are always busy and working as hard as they can to get good results. Owing to the fact that the workers know that the more output they produce, the better things will be for them and it is for this reason that the employees always have their head in the game and are trying to think of new and innovative ways of increasing their output. Doing things in this way has a dual benefit firstly it increases the amount of money which the employees are able to make and secondly, it increases the profits which the company is able to make. If everyone thinks of innovative ways to get jobs done then the company is bound to make a huge mark for itself. Another major advantage of this kind of system is that the number of products produced is very high and since the number of products produced is so high, the cost of production becomes lower for the company. In the other systems, chances are the cost becomes so high because the workers take so much of time to complete even one product. So even if the demand is a lot, the supply is very limit. Here the demand and supply are both high allowing the company to reap maximum benefits and keep all the customers happy and satisfied. Finally, rather than the bosses setting deadlines for the workers, the workers set their own deadlines and sometimes even finish the task before the stipulated time. Everything is dependent on them, including the money which they make so that is why they take their job very seriously and even work from home when they think that they are running short of time. As it is often said, there are two sides to every story, so even if there are a number of advantages of the system, there are also disadvantages. The major disadvantage of this kind of piece-rate pay is that the workers try too hard to finish the task at hand, that the quality of work suffers and they give up substandard work. In the attempt of trying to make more money, they often cut corners and even give up incomplete work hoping that this will go undetected. Things like this greatly affect the reputation and name of the company concerned. As mentioned above, the workers often decide on their own deadline and they complete the work when they can, it is for this very reason that there is no uniformity in the work output and it becomes quite a challenging task to plan for the future of the company or to even make out a proper schedule of production. Another big disadvantage of this system is that the workers and employers find it very tough to fix a reasonable cost for the finished product. Narrowing down on one figure which both parties will be happy with is quite a challenging and even time-consuming task which requires hours of talking, convincing and negotiations. In such a system the workers try their best to make as many products as possible. In the attempt of trying to make more and more money, they often end up overworking themselves. Doing too much work without taking any breaks is bound to take a toll on the health of these workers. As a result, they might come in for serious problems like stress, heart trouble or even high blood pressure. As mentioned above, an advantage of the system is that the workers work independently and don’t need micromanaging. But sometimes in the attempt of trying to work quicker, the workers give up bad quality work and even use inferior quality products. By this, the finished products require even more scrutiny and most often many products get rejected because they are not fit to be sold to the customers. Each method of wage payment system has its own advantages and disadvantages. Each company should do what they think is best for them rather than trying to follow what another top company is doing. Piece Rate compensation or pay as opposed to the other payment system is rather fair and is also rather uncomplicated. Opting for it would be a rather good option for all concerned as it ensures that the worker gets his dues for exactly what work he does and the results which he delivers. Workers should be attentive to exactly how many finished products they are submitting and make a note of it on their own.